Why you shouldn't be afraid to take risks. Today Past President, Thomas McMillan received on behalf of the Rotary Club of Abbotsford-Sumas, the coveted Governor's award for 2016-2017. Only 5 clubs received the Presidential citation and 4 clubs received the Governor's award out of 57 clubs in our district. Thank you District Governor Lindagene Coyle! Projects chair Dr Ron Lewis presents a check for $2000 to the Salvation Army of BC for the wildfire evacuees so adversely affected this summer in the interior of our province. Thank you for all the work you do! Mike Adkins being awarded the Don Funk Service Above Self Award from President Rick Barkwell on behalf of the Rotary Club Abbotsford-Sumas. Mayor Henry Braun and his wife added a special touch to the evening as the guest speaker! Assistant District Governor, Michael Adkins receiving recognition as a Major Donor of the Rotary Foundation. District Governor, Lindagene Coyle along with club President Rick Barkwell and current Foundation chair, Thomas McMillan present Michael with a beautiful crystal and thank him (and his wife Gladys) for their support. 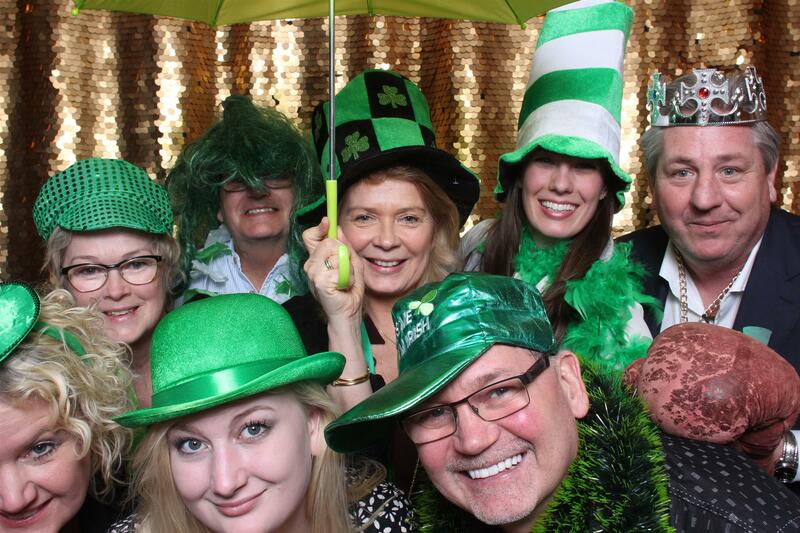 The St. Patrick's Dinner Dance plans are well underway for our March 17th event. The Committee is grateful that Prospera Credit Union has renewed as our lead sponsor for the event. As our largest fundraising event this year we have a goal of raising over $20,000 to support our community projects. We are asking all club members to support this event - invite your friends, buy a table, collect silent auction items and/or sponsor the event. If you need more sponsorship or silent auction letters please email Karina Chow at karinadchow@gmail.com. 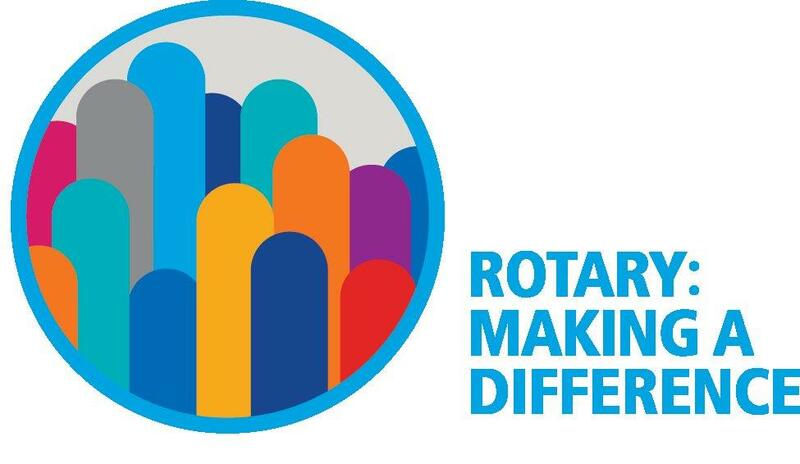 "What excites me about Miles to End Polio"
The Rotaract Club of Abbotsford always welcomes Rotary members to support their meetings or help with projects. To learn more click here. Check out the Peace Arch Journal for stories across the District. Thanks to Mike Adkins for sharing the work of the Rotary Club of Abbotsford Sumas. 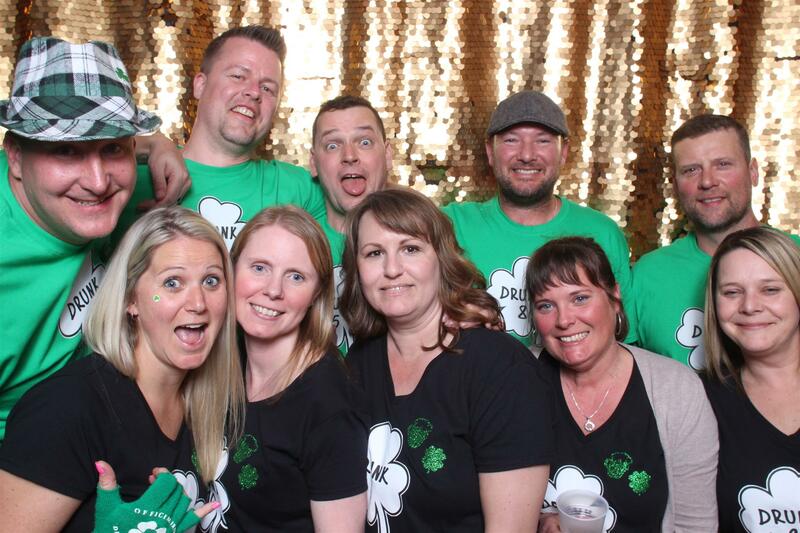 The Irish Dinner Dance was a great success! We raised over $22,000 for Club Programs and Services through our sponsorship, ticket sales and silent auction. Thanks to all of the Club members who contributed to our success that evening - we are so grateful for your support. Women in the second chance literacy program. Our Rotary club is surrounded by rural and tribal villages in the Bharuch District of Gujarat State, India. The literacy rate in these villages is low and dropout rates of students in primary schools are high, most particularly among girls. We wanted to do something about that. We conducted a survey with the help of Pratham, an NGO working in the rural literacy field across India, to gauge the condition of education in several of these villages. The study found that many girls leave school after the primary level mainly because of the lack of secondary education nearby. Students have to travel further, and for various socio-economic reasons, this makes it more likely that girls will drop out after the primary level and not go on to grades 7 or 8. Creating Small Business in Developing Countries. 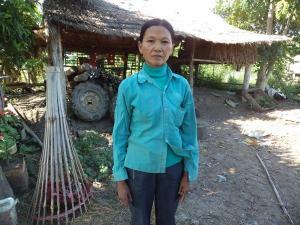 Vary is 50 years old and a resident from the Battambang province. She has five children, two of whom are still dependents as they are in school. To support herself, she farms rice, corn, and sesame. She has had this business for several years. This is the first micro loan for Vary with the Rotary Club of Abbotsford-Sumas (Kiva’s partner). She was seeking 4,000,000 KHR ($1,000 USD) in order to buy seed and insecticide, and to pay for labor costs for her cash-crop. She is now earning a good income from her business that has improved her family lifestyle. Moreover, she now has enough food to feed her three children and send them to school. The future is looking bright to be able to keep her children in school until they graduate. The Rotary Club of Abbotsford-Sumas embarked on an ambitious International Program in 2013, to Creating Small Business, to assist and grow those businesses in developing countries through a partnership with KIVA, located in 79 countries around the world. The micro loan repayments by the women we supported over the past 3.5 years, has been reinvested wisely by the Rotary Club of Abbotsford-Sumas Kiva Committee President Thomas McMillan and Past President Michael Adkins. As of December 30, 2016 just over $7,775.00 has been lent out to women with children within the farming/agriculture community in twenty-three separate countries including China, Azerbaijan, Tajikstan, India, El Salvador, Cambodia, Honduras, Armenia, Kenya, just to name a few. By reinvesting the funds repaid, 79 individual loans to date have been made by Rotary Abbotsford-Sumas with a success rate has been 97.8% with only one repayment not completed. To be a part of creating small businesses in developing countries, especially watching those mothers succeed for themselves and for their children is truly a remarkable experience that drives us to do more. The making of 100 Christmas Cards to be distributed to Seniors throughout the Fraser Valley, the donation of 448 pairs of socks in Abbotsford. Mission and Maple Ridge, the collection of 115 ibs of food along with a cheque for $192.75 (purchase power of $578.25) that was presented to the Abbotsfood Food Bank. 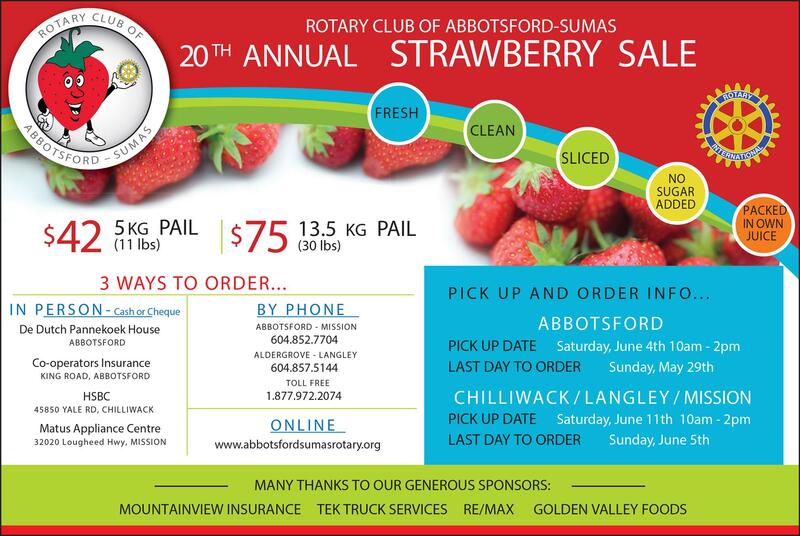 The Rotary Club of Abbotsford-Sumas is a Charter Sponsor, we are so proud of the Rotaract Club members and for us having the opportunity to be a part of this dynamic, energetic, goal oriented, community minded club. Thank you for all you do for the Fraser Valley Communities by seeing the need and responding to that need throughout the year. Congratulations to you all, well done! The team visits with community leaders in Kolifianu village. Life is usually made up of special moments which make it worth living. I least expected that my Rotary special moment was going to fall on 30 August, 2016. I joined Rotary barely three years ago, and by dint of my dedication and commitment to service and other Rotary activities, I got elected director of club service projects for the 2016-17 Rotary year. What exactly motivated me to join Rotary? We have two wonderful Holiday celebrations in the month of December! Ron has offered to host a Christmas potluck at his new home (thanks Ron!). If you are able to come to the potluck please send me an email. Once again we will be hosting a Holiday Breakfast just before we break for the Christmas holidays. Please bring an item for a child (pyjamas, stuffed animals, scarves and gloves) that we can provide to the Women's Resource Centre. In lieu of a gift exchange each member is asked to bring a bottle of wine that will be used for the Irish Dance Wall of Wine. I will start collecting items next week. The award was presented to Ron Kelly of the Abbotsford Rotary Club, Ralph Payne of the Abbotsford-Sumas club, and Raj Patara of Abbotsford-Matsqui. A member since 1992, Kelly has been president, consistently supports club activities and programs, is a multiple Paul Harris Fellow recipient, and serves as the long-standing Rotary Foundation chair. “Ron Kelly is one of the steadiest, quietest and most conscientious leaders of the Rotary Club of Abbotsford,” said president Sara Lawson. Payne is a past president charter member of the Abbotsford-Sumas Rotary Club, a multiple Paul Harris Fellow recipient, and has helped the club to be a top achiever in donating to the Rotary Foundation. “Ralph was always the go-to person when our club had a difficult decision to make, either financially or projects-based, and is definitely a committed Rotarian,” said president Thomas McMillan. Patara is the current director of guest speakers and field trip planning for the Abbotsford-Matsqui club. “Raj continues to show a contagious enthusiasm for Rotary and goes out of her way to continually share the spirit of Rotary,” said president Mike Welte. The award is named in memory of Don Funk, who was a member for many years of the Rotary Club of Abbotsford. He was recognized for his dedication to the community and to overseas projects for Rotary International with the Service Above Self Award, the highest honour given to a Rotarian. Funk was also instrumental in chartering the other two local Rotary Clubs. The award to the three individuals was presented by Abbotsford Rotarian Ken Funk – brother of Don – and assistant governor Brad Whittaker of the Chilliwack Rotary Club. On November 12, 2016, Past President Michael Adkins, President Thomas McMillan and Past Assistant Governor Wendy Neufeld with her husband Terry went to Mt. Vernon Washington to celebrate the great success by the clubs in providing funds to District 5050’s Foundation for 2015-2016 to continue on with financial assistance in community and global projects. One of only 1,564 clubs out of 35,399 Rotary Clubs worldwide, to achieve Top Three Highest in Per Capita Annual Giving honours in their district. One of only 4,609 clubs worldwide to become 100% Foundation Giving Club. The object of Rotary is to promote and support the idea of service as the foundation for worthy enterprise. 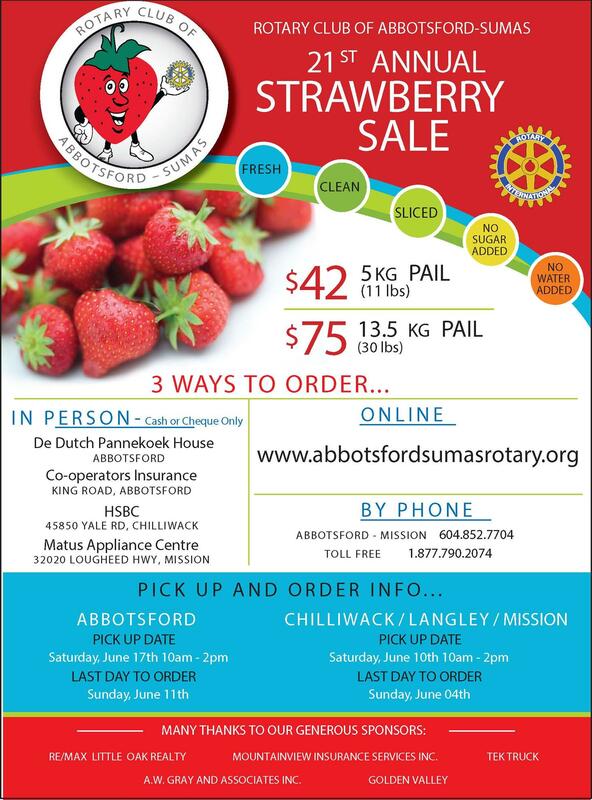 The Rotary Club of AbbotsfordSumas pursues that goal by engaging in on-going campaigns to support special projects within the local community and the international community. 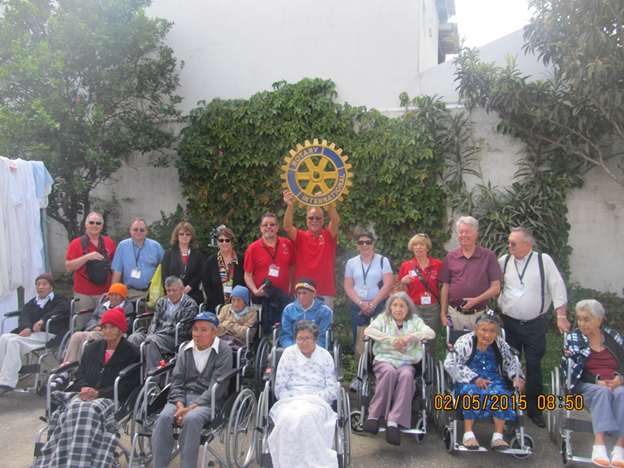 On February 2015, with six members of the Abbotsford-Sumas Rotary Club and with the wheelchairs purchased by the Rotary Chilliwack and Rotary Club Abbotsford plus our club‘s partner Inspired by Vision (Grand Prairie) a container of 280 new wheelchairs were delivered to Guatemala City & Antigua, Guatemala. The hard work on the ―ground‖ in Guatemala was done by our club partnering with Rotary Club‘s of Guatemala City and Rotary Club of Antigua for the needs assessments and arrangements for the wheelchair delivery prior to the Rotary Club of Abbotsford-Sumas arrival. The Rotary Club of Abbotsford-Sumas is currently in the process of delivering another 280 new wheelchairs to Guatemala to be distributed February 2017, to individuals and hospitals that are in dire need of them. Once again a number of Rotary Club members along with our partner Inspired By Vision, will travel to Guatemala City and Antigua in February 2017 to assemble the wheelchairs and personally deliver them to 280 recipients. This delivery however has additional partners. The Rotary Club of Abbotsford-Sumas is honored and proud to announce the Rotary Club of Chilliwack, the Rotary Club of Abbotsford, the Rotary Club of Abbotsford-Matsqui and Inspired by Vision (Grand Prairie) are partners in this financial and hands on project. These are no ordinary wheelchairs. They are crafted to be extra durable and to endure the harsh terrain of rural roads and the tests of time. 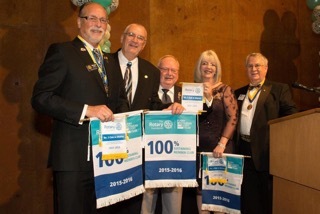 On Wednesday Oct. 12, 2016 Assistant District Governor Brad Whitaker came to our breakfast meeting to present the Rotary Foundation 100% Paul Harris Fellow Club Banner to President Thomas McMillan and Foundation Director Mike Adkins. The Executive Board of Directors had approved the request to honor President Thomas for his seven years of dedication as Foundation Director and the great job he did to make us one of the high est Foundation giving clubs in District 5050. This distinction as a 100% Paul Harris Fellow Club is only recognized once in a club's history. We have had some great speakers in August - Dave Mackintosh of the Mt Cheam Lions Club presented to us the legacy project they are working on for the Chilliwack Hospital Eye Centre that serves a regional base of clients and does over 5300 eye surgeries annually. Grace Tan spoke to us about her experience in Ottawa with the Adventures in Citizenship program sponsored by our club and organized by the Rotary club of Ottawa - she was funny and engaging in her presentation. Our club has a strong focus on youth and supporting the various youth programs that Rotary has in place to promote leadership and mentoring skills for young adults. Stay tuned for upcoming programs that we sponsor such as Youth Adventures in Leadership and RYLA. Mentor a young leader, and discover yet another reason to love Rotary. You’re up at 5:30 a.m. for your sunrise meeting. You stay long after the sun goes down to clean up after your club’s event. And, last spring, you raced daylight across twelve time zones to join other Rotarians at a national immunization day. Rotary moments? You’ve got 20. You love everything, from polo shirts to Paul Harris Society pins, except for this mentoring stuff. For you, youth service has the awkwardness of a school cafeteria, the uncertainty of a drama club trust fall, and the terror of a university quiz on German declension. It’s small wonder you’re first on the list for the highway cleanup, with its predictable neon vests, and last to host an exchange student, advise an Interact club, or mentor Rotaractors. The Rotary Club of Grand Cayman’s project team to Guatemala. We all have our stories of how we were introduced to Rotary, and for the most part, those stories are positive. I could have been a Rotary member much sooner, had someone approached me. Where are all the young members? It may seem like young members are as elusive to catch as Pokémon, but with the right strategy and awareness, it’s not that difficult at all. The truth is, they are really all around us. They may be in your work place, they may be in your neighborhood, or they may be in those other social gatherings you belong to. Others may be active in our youth programs like Rotaract and RYLA, readying themselves for the challenges that lie ahead. The Avenues of Service are part of the guiding principles of Rotary and the foundation of club activity. Club Service focuses on making clubs strong. Club service promotes fellowship between members and creates a stronger relationship with the local community. Learn how a Ugandan club brought hope to local communities through health projects. Community Service encourages every Rotarian to find ways to improve the quality of life for people in their communities. Read how the Rotary Club of Bozeman Sunrise (USA) brought together their entire community. International Service exemplifies your global reach in promoting peace and understanding. Sponsor or volunteer on international projects, or attend a project fair to make a global impact. Vocational Service calls on every Rotarian to work with integrity and contribute their expertise to the problems and needs of society. Learn how you can bring vocational service to life through club projects. Youth Service recognizes the importance of empowering youth and young professionals. Read how Rotaract clubs are building stronger communities through sustainable service projects. Joyce Dove, with the Rotary Club of Tallahassee Northside, Florida, USA, found inspiration in the 2015-16 Presidential Citation goal of contributing to a project on Rotary Ideas. On Rotary’s crowdsourcing site, she connected with a club in the Philippines requesting materials to open a library. “These are the sort of projects, especially the international ones, that make Rotary special,” she says. “These types of relationships, built over time, are more meaningful. Rotary Ideas is great because you feel more connected with clubs and people around the world, outside of getting just ordinary emails.” Read her full story. Rotary discussion groups offer a place for Rotarians, Rotaractors, Rotary Peace Fellows, and program alumni to share their experiences and ideas to members of the Rotary family. We invited experts from The Rotary Foundation Cadre of Technical Advisers to moderate discussion groups on Rotary’s areas of focus until 30 September. The cadre consists of volunteer Rotarians who offer technical expertise and advice to Rotarians on their Rotary projects. Whether you are looking to assess a community, make your project sustainable, or pursue a global grant, our experts are here to answer your questions and guide discussions on the most pertinent topics. Join the conversation! Apply your vocational skills to a project. Join or work with a Rotarian Action Group on a service project. Review the humanitarian service goals to learn how your vocational service projects can help your club qualify for the 2016-17 Presidential Citation. What does a Rotary club designed by younger members look like? A panel of three young members spelled out for us the issues that block young people from joining Rotary during our spring assembly a few years ago — scheduling, cost of dues, and rules. I’ve been active in developing leaders in our community and have worked with our Group Study Exchange teams in the past, so I know the energy and potential in this “under 40” generation that we need to tap for Rotary. But I’ve also seen several Rotary clubs try to do this with limited results, because they stayed too close to the traditional model and dues structure. To break that mold, I asked the son of a fellow member to gather a group of young people in the metro area of Savannah to explore the idea of starting a new club. I told them their are really just a few rules – to meet weekly, pay dues, and train a president-elect. The rest are just a lot of traditions. They were directed to develop a format that would meet theirneeds. The team included young professionals with a Rotarian parent, past exchange participants, and others who were just interested in tackling the challenge. Several had taken part in our leadership development program and wanted to keep learning about the community. Others were in a social group that met monthly but craved more substance. After an initial meeting or two with district leaders, the team met on their own for six months to craft a plan and draw up a list of candidates. When they had 75, they invited them to a reception to introduce the concept and explain how to become a charter member. Applications came in quickly and they froze the group at 50 to submit their charter application, adding the remainder to a waiting list. The Metro Savannah Rotary Club started with a bang and has never looked back. They are careful to add members who maintain their diversity and bring in unique perspectives.Their membership includes engineers, construction managers, attorneys, graphic designers, sales managers, librarians, and non-profit directors. Annual dues is $300. Members stay up to date on Facebook. They meet for lunch the first and third week of the month, calling in sandwich orders. Another week, they network at a pub over drinks. This in itself invites membership inquiries from others in the pub. And at least one meeting is a service project. The club has had at least 12 projects every year. After a year, the board held a full day retreat to examine their format and make tweaks. Attending only as an observer and resource, I was impressed these busy young professional gave up most of their Saturday to evaluate and plan. On Rotarians at Work day, April 30th, a group of club members, along with a number of volunteers and leaders Karen Funk and Brenda Falk of Tanglebank Gardens, spent the day cleaning up the gardens around the Cottage Pavilion. 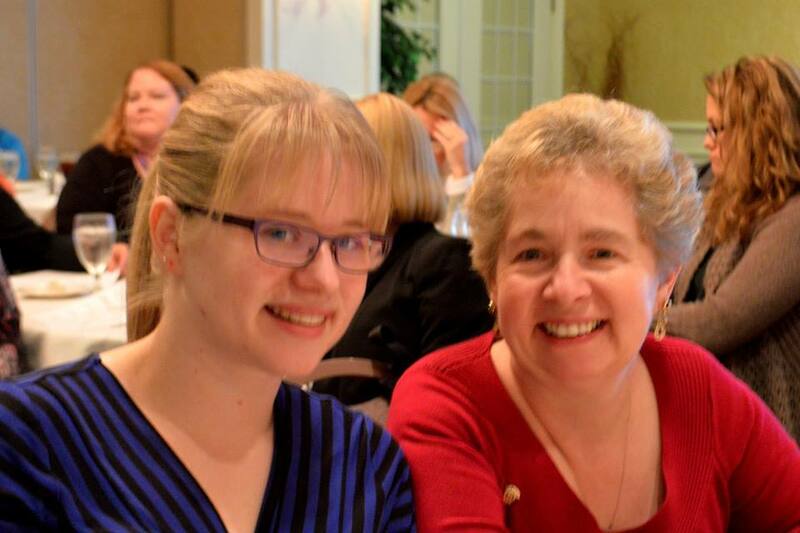 Last week we were lucky to have Cheryl Klassen and daughter Allycia Myers visit Rotary Club 5342 in Hanover, Pennsylvania! 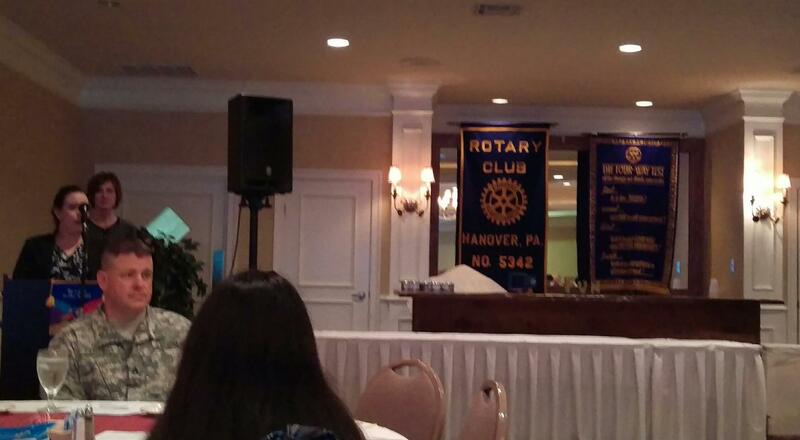 Cheryl took this opportunity to tell the club all about the "Strawberry Club" and our other fundraising efforts. Great Job Cheryl! Recently we inducted new member, Kelly Nix, along with Jason Epp as a transfering in member. Looking forward to their fellowship and contributions to our club! Recently our club presented checks to various community partners for projects we are funding. Pictured is Kelly Railton of MSA Museum, Kimberly McMillan for the MS Walk, and Steve Gill for the Gutsy Walk. 1. National Museum of Korea: If you have time for only one, this museum, the sixth largest in the world, has something for everyone: relics from prehistoric times, calligraphy, paintings, sculpture, and even a children’s museum, all housed in a six-story building in the wooded Yongsan Family Park. 2. Korea Furniture Museum: To see how Koreans of the past lived, walk through the 10 restored hanok homes that make up this museum. See how its 500 pieces of furniture on display were used in daily life. Reservations required. 3. Leeum, Samsung Museum of Art: The three buildings housing this museum’s exhibits are themselves works of art, designed by renowned architects Mario Botta, Jean Nouvel, and Rem Koolhaas. 4. War Memorial of Korea: Learn about the history of the Korean War, re-enact a night battle in the combat experience room, and climb inside restored tanks and aircraft. 5. Museum Kimchikan: If you’re shopping in Insa-dong, stop at this museum that pays homage to kimchee, the pickled cabbage that’s part of Korea’s national identity. The three-story museum moved into new quarters in 2015. Register today for the convention at www.riconvention.org. Early registration savings end 31 March. Clara Montanez attends a reception in 2013 for the Champions of Change honorees at the White House in Washington D.C. When Clara Montanez was a student, she never heard the word mentoring. The idea of having a role model help you pursue your ambitions was unfamiliar to her. "You basically chose your career based on personal interest and hoped you could find a job," says Montanez, senior director of investment for Oppenheimer & Co., Inc. "I went the route of getting married and having children first, and started my career later in life. I had no model for how to do that." That changed for Montanez the day a friend invited her to join Rotary. "Frankly, I was dragged into Rotary. I didn't see a connection at first," says Montanez, who's been a member of the Rotary Club of Washington, D.C., since 2003. "But then I met several women, including Doris Margolis, who took me under her wing and started mentoring me on how to get more involved. I began seeing the value in having someone I could count on as a mentor, and I have become more of a leader in our club, in my community, and at work." Rotary's mentoring opportunities motivated Montanez, Rotary's alternate representative to the Organization of American States, to help organize an event for International Women's Day, 8 March. The event, to be held at the World Bank Group headquarters in Washington, will feature Deepa Willingham and Marion Bunch, both previously honored as Rotary Women of Action. Rotary International Director Jennifer Jones will moderate the event, which will be streamed on World Bank Live. Montanez says Rotary has given her a platform to mentor young women as they balance career and family, as well as manage the challenge of repaying student loans. According to a recent study by the American Association of University Women, the student loan debt burden weighs more heavily on women because of the persistent gap in pay between women and men. 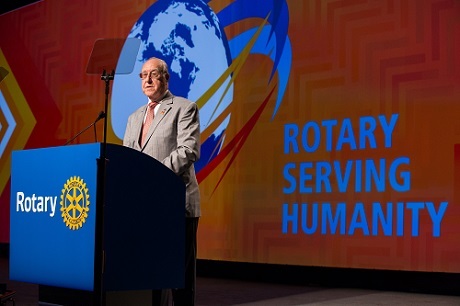 "I think Rotary has given me access to young people, like Rotaractors, and they are ready to accept guidance because Rotary is a safe place to reach out and get advice," says Montanez. Similarly, Jackie Huie, a member of the Rotary Club of St. Joseph & Benton Harbor, Michigan, USA, recognizes Rotary's mentoring power. In 2007, Huie's club created a program that matches high school juniors and seniors with a mentor in the field they'd like to enter. The program started with 40 students at one high school and has now expanded into schools across the area. "I got a letter from a girl who came from a poor background, and through the program, she got a chance to meet with an attorney in town," says Huie, president of JohnsonRauhoff, a multimedia company that fosters creative thinking for artists. "It inspired her and gave her confidence to go to school and study law. She got accepted into four law schools and is on her way to becoming an attorney." Besides the investment in young people's futures, mentoring brings clubs important community recognition. For example, Huie's club has 150 members, a large number for a club that doesn't hold membership drives, she says. "Everyone in southwest Michigan knows about Rotary," says Huie. "We had a student who wanted to be a CEO for a large corporation. After we arranged for him to meet with the CEO of Whirlpool, his father was so impressed with the whole program that he joined Rotary." Many of the program's early participants went on to form an Interact club, and there are now more than 200 Interact members at four area schools. Forty of them will travel to the Dominican Republic this summer to install water filters and take part in a medical mission. "It's important for Rotary to make an investment in young people," says Huie. "My own daughter is in Interact because of my membership in Rotary. I think her world is broader, and she looks at the world differently. We all do, because of what we've learned through Rotary."